My last stint of fieldwork this summer had me checking off a box on my bucket list, I finally made it to York Factory! Why did I want to go there so badly? Well, not only is it one of the most important Hudson’s Bay Company sites, it was also the entry-point for early immigration to our province and beyond, I knew I had to see if for myself. In partnership with Parks Canada, York Factory’s current custodians as it is now a National Historic Site, Kevin Brownlee and I set out with a fantastic videography duo (Kevin and Chris Nikkel) from Five Door Films to try and capture the essence of the site and bring it back for our museum visitors. York Factory is located near the mouth of the Hayes River, it’s not the most convenient location for most Manitobans or tourists to visit. That said, the site and surrounding environment is INCREDIBLE so if you ever have the chance to travel up that way, jump on it! 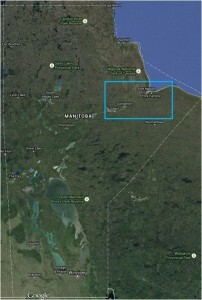 Map of Manitoba showing area of our journey (Map adapted from Google Earth). A close up of the Nelson and Hayes rivers (Map adapted from Google Earth). Our journey to the site was just as amazing as the site itself, we opted to travel by boat so we arranged our trip with Clint from Nelson River Adventures. 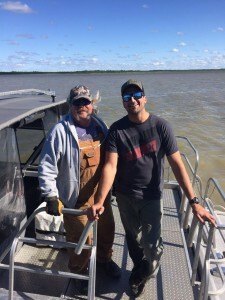 Clint was incredibly helpful with the planning and logistics, and he even arranged our transportation from the Gillam airport to his boat launch. Nelson River Adventures has a pretty sweet set-up to take folks out to York Factory. 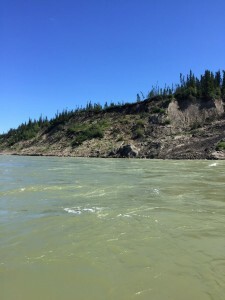 The Nelson River was very scenic, we went through some rapids, saw eagles flying overhead, and made a quick stop on Gillam Island to inspect a plaque in honour of Thomas Button (the first European to set foot in Manitoba in 1612, and the one to give the Nelson River its name). The Nelson River is stunning. Plaque on Gillam Island in honour of Thomas Button. As we came to the mouth of the Nelson a bank of fog rolled in, making old Port Nelson look extra creepy. 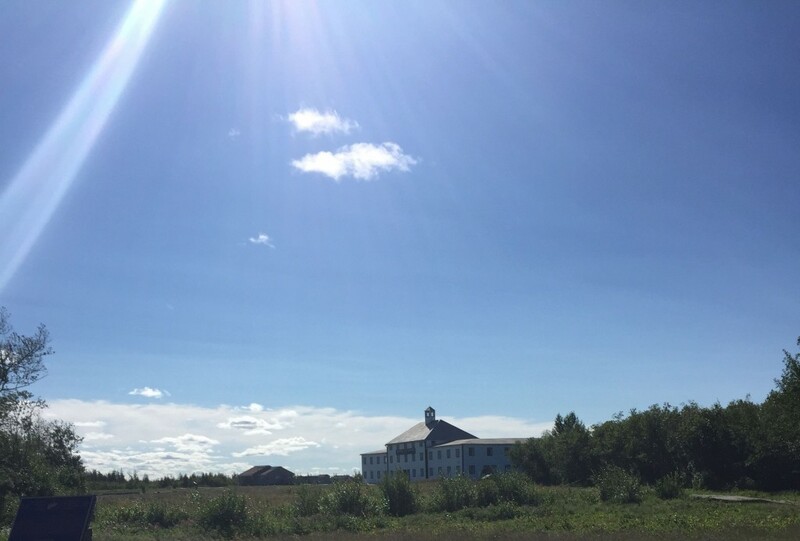 In 1912 the Canadian Government had selected this site over Churchill for their port on Hudson Bay and planned to link it with the Hudson Bay Railway. There were many reasons why this attempt was unsuccessful (too many for this post!) resulting in the abandonment of the site in 1918. Now all that remains is a wrecked dredging ship, and the truss bridge out to a man-made island. 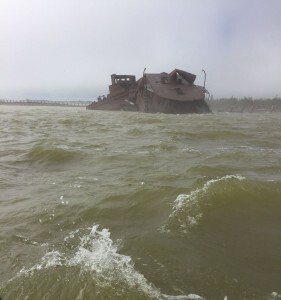 Wrecked dredge at Port Nelson. The fog persisted as we emerged into Hudson Bay, and the sea was angry! It was just as I imagined the Bay to be, I would have been disappointed if it was smooth and calm. The boat has to swing out wide into the bay to avoid the shallows of Marsh Point between the Nelson and Hayes rivers. Clint deftly handled the waves while we enjoyed the bumpy ride. Our Captain Clint with First Mate Grizz. Eventually we made our way around the point and down into the Hayes. 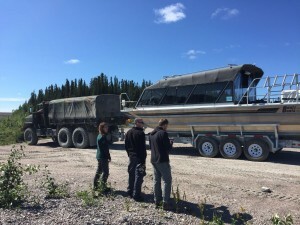 Claude and Kyle (Parks Canada site manager and summer student) were waiting for us at the dock and helped us unload all of our gear. We’d made it, and while the journey itself was exciting we were in for a lot more during our week-long stay! After climbing up the steep steps from the dock this is the view I was greeted with! The Depot is in the foreground and the Parks Canada staff house in the distance. Amelia Fay joined The Manitoba Museum in September 2013. 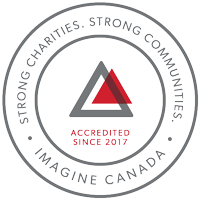 She received her BA in Anthropology from the University of Manitoba, an MA in Archaeology from Memorial University of Newfoundland (MUN), and is currently finishing her Doctoral degree from MUN. 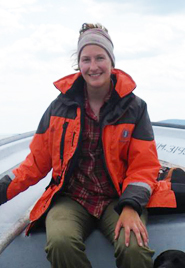 Amelia’s research has focused on Inuit-European contact along the Labrador coast, and her interests are continually expanding to explore Aboriginal-European contact throughout Canada during the fur trade era. Amelia’s job as Curator of the Hudson’s Bay Company Museum Collection involves building the collection, responding to public inquiries, preparing exhibits, and conducting her own research. Her research interests centre on the interactions between Europeans (including HBC employees) and Aboriginal peoples as they negotiated space, material culture, and their daily activities. Amelia’s goal is to showcase this amazing collection, and highlight the important role that Aboriginal people played in the establishment of the Hudson’s Bay Company.